Extra Large Persian Rugs (9x12 ). Large Persian Rugs (7x9-9x12). Small Persian Rugs (3x5 & Smaller). Persian Runners. Palace Persian Runners. Very Good ! You can expect our service to be friendly and professional. Bordered, Tribal style rug with Dark Burgundy, Dark Copper, Dark Navy, Light Brown, Teal accent colors. Hand-knotted and constructed from 100% Wool with 100% Wool foundation. Material: 100% Wool. Foundation material: 100% Wool. Bordered, Tribal style rug with Blue, Burgundy, Cream, Green, Light Brown, Red accent colors. Hand-knotted and constructed from 100% Wool with 100% Wool foundation. Material: 100% Wool. Foundation material: 100% Wool. Hand-knotted and constructed from 100% Wool with 100% Wool foundation. Material: 100% Wool. Foundation material: 100% Wool. eCarpetgallery has unique access to major carpet producing areas, small villages and nomadic tribes in Persia, Afghanistan, Turkey, Republic of Russia, Pakistan and India. Gabbeh Persian Rug 4X6. Large Persian Rugs (7x9-9x12). Small Persian Rugs (3x5 & Smaller). Persian Runners. Palace Persian Runners. Hand Knotted. Very Good ! - Abrash (Great Shape - Thick Pile). Extra Large Persian Rugs (9x12 ). Large Persian Rugs (7x9-9x12). Small Persian Rugs (3x5 & Smaller). Persian Runners. Palace Persian Runners. Bakhtiari Persian Rug. Balouch Persian Rug. Botemir Persian Rug. Kashan Persian Rug 10X13. Large Persian Rugs (7x9-9x12). Small Persian Rugs (3x5 & Smaller). Persian Runners. Palace Persian Runners. Hand Knotted. Very good! You can expect our service to be friendly and professional. Tabriz Persian Rug 10X13. Large Persian Rugs (7x9-9x12). Small Persian Rugs (3x5 & Smaller). Persian Runners. Palace Persian Runners. Very good! 40-50 Years Old. Orders must be Prepaid before Pickup. Kashan Persian Rug 10X13. Large Persian Rugs (7x9-9x12). Small Persian Rugs (3x5 & Smaller). Persian Runners. Palace Persian Runners. Orange Rugs. Red, Navy Blue, Royal blue, Cream, Brown, Green, Tan, etc. Mashad Persian Rug 10X13. Large Persian Rugs (7x9-9x12). Small Persian Rugs (3x5 & Smaller). Persian Runners. Palace Persian Runners. Very good! -Full pile- Birds design - Abrash. 13'0 X 9'6 Ft.
Gabbeh Persian Rug 2'6X3'7. 100% Fine Wool. You can expect our service to be friendly and professional. Persian Runners. Red, Gold, Maroon, Cream, Green, etc. size (cm) 3'7 X 2'6 Ft. size (ft). Kashmar Tabriz Persian Rug 3X6. Large Persian Rugs (7x9-9x12). Small Persian Rugs (3x5 & Smaller). Persian Runners. Palace Persian Runners. You can expect our service to be friendly and professional. Kashan Persian Rug 10X13. Large Persian Rugs (7x9-9x12). Small Persian Rugs (3x5 & Smaller). Persian Runners. Palace Persian Runners. Red, Navy blue, Cream, Gold, Khaki, Salmon, Green, etc. Hand Knotted. Gabbeh Persian Rug 6X8. Large Persian Rugs (7x9-9x12). Small Persian Rugs (3x5 & Smaller). Persian Runners. Palace Persian Runners. Excellent - Thick pile Persian modern - Abrash. Hand Knotted. You can expect our service to be friendly and professional. Large Persian Rugs (7x9-9x12). Small Persian Rugs (3x5 & Smaller). Persian Runners. Palace Persian Runners. You can expect our service to be friendly and professional. 30-35 Years Old. Red, Midnight Navy, Green, Cream, Orange, Burgundy, Khaki, etc. Hossainabad Persian Rug 4X5. Large Persian Rugs (7x9-9x12). Small Persian Rugs (3x5 & Smaller). Persian Runners. Palace Persian Runners. Dark Coral, Persian Blue, Green, Ivory, Orange, Tan, etc. You can expect our service to be friendly and professional. Balouch Persian Rug 5X8. Large Persian Rugs (7x9-9x12). Small Persian Rugs (3x5 & Smaller). Persian Runners. Palace Persian Runners. Very Good ! You can expect our service to be friendly and professional. Antique Persian Malayer rug. 4'7"x 7'9"
Area rugs can be used to warm a space with texture and colour. Different sizes, styles, and patterns mean that area rugs appeal to a variety of different tastes. Selecting the right area rug for your space has more to do with personal preference than any kind of design rules. What are traditional area rug sizes? Some styles of area rugs may be available in custom dimensions or other sets of lengths and widths. Area rugs are smaller than carpets and provide warmth, texture, and colour to a space. They can help to organize furniture design or serve as an element of focus in the room by displaying a pattern or artistic scene. Area rugs are easy to clean and can be replaced or switched out if you decide that you want to rejuvenate your living space. White and ivory area rugs are more difficult to clean, but replacing an area rug is almost always easier than replacing an entire room full of carpet or hardwood flooring. What materials are used to craft area rugs? Low, medium, and high pile rug, cotton, wool, jute, bamboo, fabric, and even natural material like stones can be utilized to make different kinds of area rugs. Different materials allow for the rug to have different properties. An area rug with pile will warm a space, physically and aesthetically, while a rug that incorporates smooth stones will cool it. Even animal hides and leather can be used in area rug design; textiles vary widely. Cleaning processes for area rugs depend on the type of material they are made from. Medium to high-pile rugs, including shag, should be completely cleaned annually to remove all of the dust and allergens that might be trapped deep in the rug. Vacuuming regularly will address some of this. 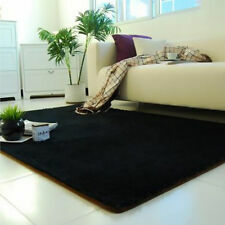 Lower-pile and flat rugs should be shaken outside every couple of weeks and hit to remove dust. These rugs can also be vacuumed regularly. Natural fiber rugs require careful care. Tags with cleaning instructions can help to discern which particular cleaning routines will be helpful. How do you select an area rug? There are really no rules when it comes to selecting area rugs. If you are going to use the rug to line your entire space, ensure two feet of floor space around the rug by measuring the room length and width. You can layer rugs for a cozy, artistic effect, or leave them solo to draw more attention to one rug in particular.